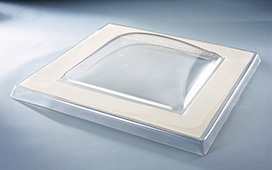 Available in 70mm and 100mm flat flanges, Mardome Reflex means that the roof light can be mechanically fixed to existing kerbs of varying dimensions, without the use of a kerb adaptor. Moulded in Marlon FSX Longlife, Mardome Reflex's glazing is up to 200 times stronger than glass. The high resistance to adverse weather conditions and breakage means Mardome Reflex is a very safe and reliable dome rooflight option. Mardome Reflex roof light is available in a curved dome or a pyramid profile in either clear, bronze or opal tints or a textured glazing option. A wide range of sizes in single, double and triple skin polycarbonate glazing are ex-stock. Roof light sizes below are overall Dome/Pyramid size. 24hr Delivery Available on some standard Mardome Reflex sizes. UK Mainland Only. Flat Flange 70mm Only. Not available for Pyramid Profile or Bronze Glazing. Order to be placed by 12:00 noon. Charges apply. Select Rooflight Express delivery at checkout. Delivery Mon-Fri only. FREE delivery on Non-Standard Mardome Reflex sizes - delivery 7 working days.